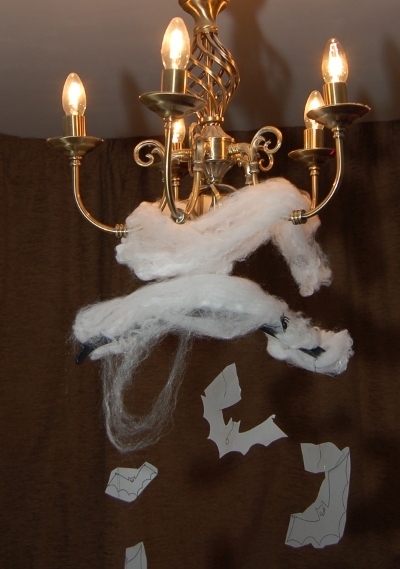 Celebrate Halloween with this easy to make flying bat decoration. It’s great fun to make with kids. The bat template for the bat shape is taken from Halloween colouring download (pdf) that I’d created previously. The bat shapes are on page 6 of the document. In our case we have some antique style lights which we also partially covered with cotton wool to add to the effect. Do not allow cotton wool to come close to the light fittings. Doing so could constitute a fire hazard. In our case there is plenty of space below and away from the actual light fittings so that the cotton wool is not close to the bulbs. This entry was posted on Saturday, October 31st, 2009 and is filed under Children, Crafts. You can follow any responses to this entry through the RSS 2.0 feed. Both comments and pings are currently closed.